You’re almost there! This month’s schedule represents the last month of a two-year reading plan. If you’ve been with us for the whole time, you’ve read through the entire New Testament twice and the Old Testament once. 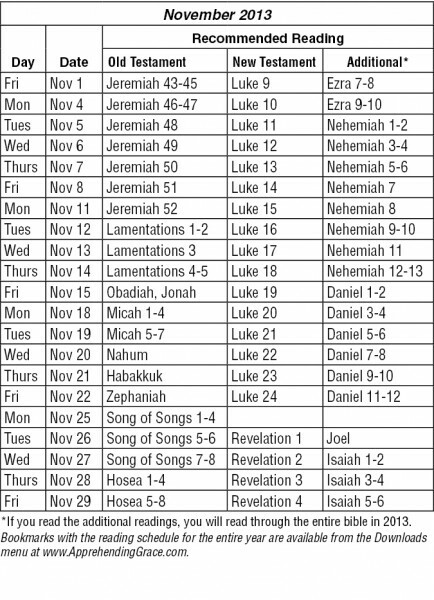 If you read the additional readings each month, you completed the Old Testament twice. Congratulations! We’ll start a new reading plan next month and I’m already looking forward to it. As I’ve read through this plan, I’ve identified things I’d like to change about next year’s plans. But that’s for another blog. If you have any ideas, please let me know. Comment on the blog, send me an email or past a message on our Facebook page. In the meantime, don’t short-change this month’s readings. Read them with the Christmas season as a backdrop. Savor the final words of our Lord as you read through Revelation. Watch for all the prophecies about Jesus as you read through Isaiah. Enjoy and praise as you read the Psalms. Dwell in the love of God as you read 1, 2 and 3 John. I’m so looking forward to reading this month. Hope you are, too! The December Reading Schedule also appears at the end of this blog. The recommended reading schedule for December is below. October – the month of beautiful trees, a briskness in the air, bonfires and the annoying start of Christmas items in stores! 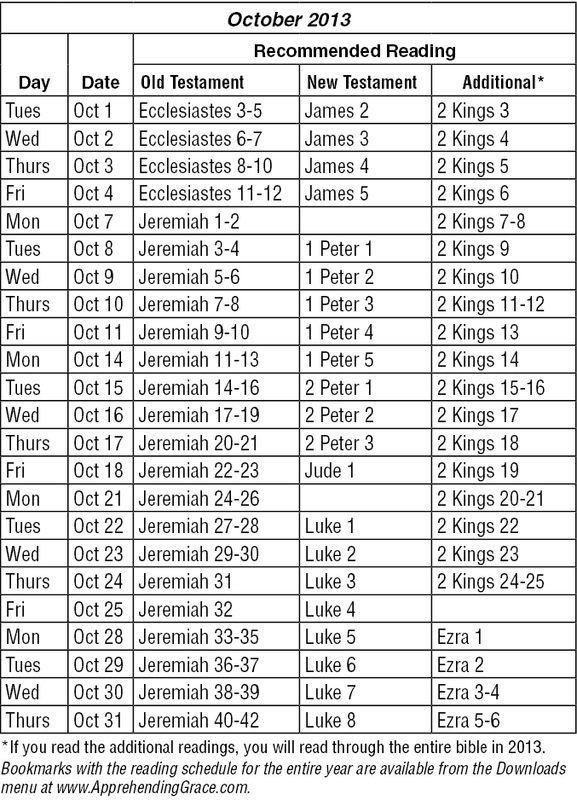 It’s also the month for reading the books of Jeremiah, James, 1 and 2 Peter and Luke. Throw in 2 Kings if you’re reading the additional readings. And the encroaching coolness outside makes it a great time to curl up and read. If you’ve fallen behind and are looking for a good place to jump back into the readings, this month is perfect. 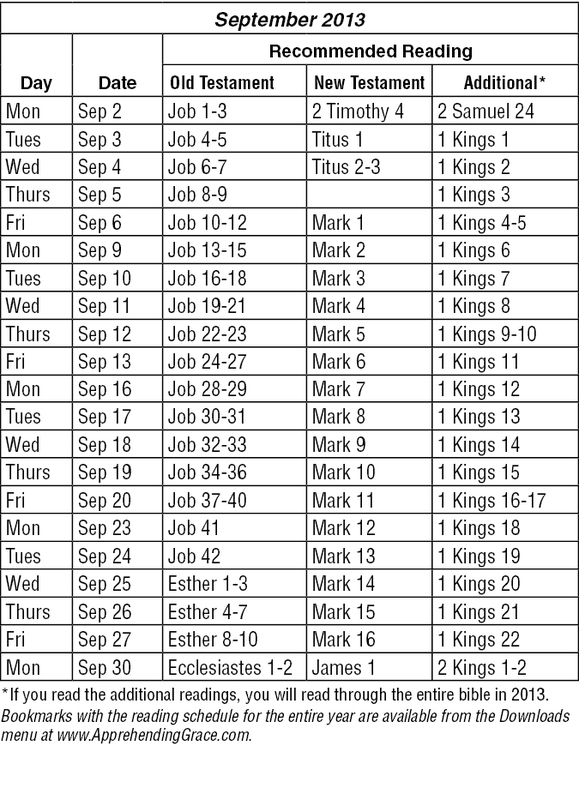 Start on September 30th and you’ll join us at the start of Ecclesiastes and James. From here, the readings provide a great build up to Christmas. 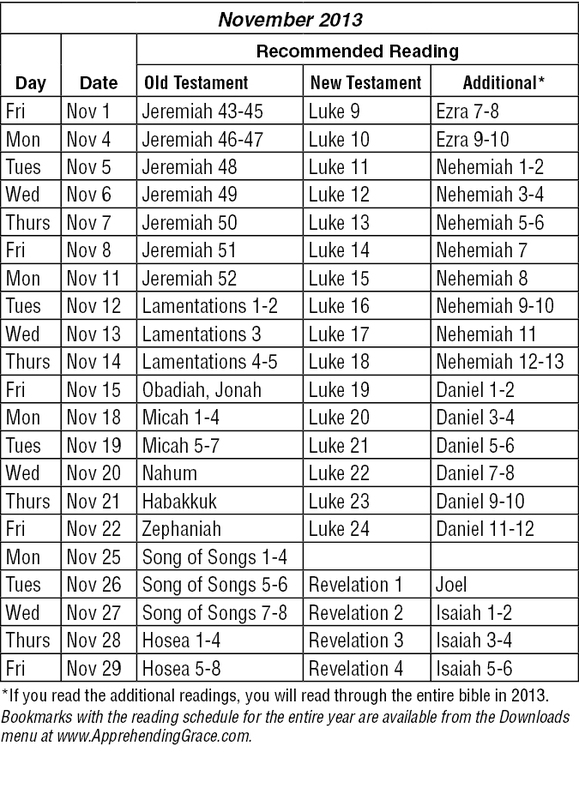 The New Testament readings will put you in a perfect place to enjoy the holiness of the upcoming season. The following buttons will open PDFs of the September/October bookmark or all bookmarks. After the file has opened, you can print it or save it to your hard drive from your browser’s file menu. The October Reading Schedule also appears at the end of this blog. The recommended reading schedule for October is below. While fall doesn’t officially start until about three weeks into the month, the beginning of September always feels like the beginning of fall to me. And it’s always a time when routines are adjusted to the change in schedules. 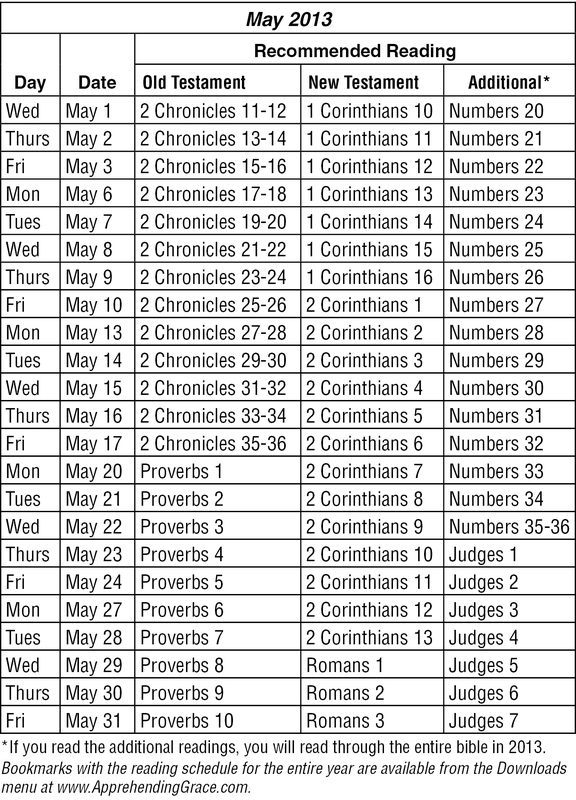 Be sure to keep your Bible reading in your schedule! Our Resting at the River’s Edge schedule will help you stay on track, reading four or five chapters each weekday. If you fall behind, don’t worry about it! That’s why we only schedule readings on weekdays – so we can use the weekend to catch up. And if you can’t catch up on weekends, still don’t worry about it! Just keep reading at a pace that allows you to enjoy God’s Word. I’m confident that God will reveal Himself to you as you take time to get to know Him. Click on one of the following buttons to open a PDF file of the September/October bookmark or all bookmarks. After the file has opened, you can print it or save it to your hard drive from your browser’s file menu. The September Reading Schedule also appears at the end of this blog. I look forward to hearing from you about how God is speaking to you through His Word during the coming month. Email me, leave a message on our Apprehending Grace Facebook page, or post a comment at the end of any blog. The recommended reading schedule for September is below. We’re down to the final days of summer. Take a bit of time to sit in the sun (or shade) and enjoy God’s Word over the next few weeks. Use our Resting at the River’s Edge schedules to stay on track with us, reading four or five chapters each weekday. If you fall behind – don’t worry about it! Use the weekend to catch up or don’t worry about keeping up. Just keep reading. God will reveal Himself to you – He promises to! Ask Him to and He will. Click on one of the following buttons to open a PDF file of the July/August bookmark or all bookmarks. After the file has opened, you can print it or save it to your hard drive from your browser’s file menu. Click here for the July/August 2013 recommended reading bookmark. Click here to download all bookmarks for 2013. The August Reading Schedule also appears at the end of this blog. I love the way God’s Word seems to speak to my specific situations as I read through His Word. I know He’ll do that for you, too. I’d love to hear about it. Email me, leave a message on our Apprehending Grace Facebook page, or post a comment at the end of any blog. 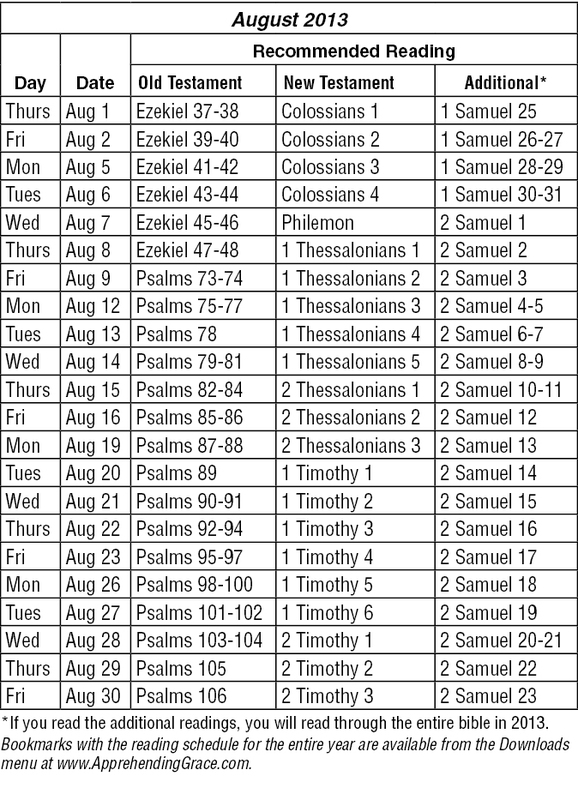 The recommended reading schedule for August is below. Make God’s Word the cornerstone of your summer reading schedule. 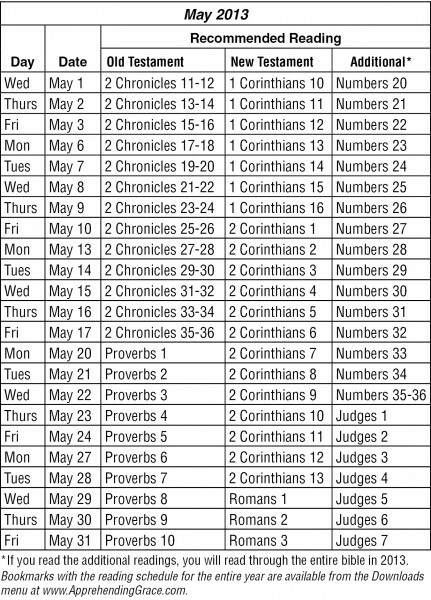 Join us as we read through a few chapters of the Bible each day. Use our Resting at the River’s Edge schedules to stay on track with us. If you fall behind – don’t worry about it! Just keep reading. I am praying that God will reveal Himself to you as you read each chapter. Ask Him to and He will. The July Reading Schedule also appears at the end of this blog. I hope you’ll join us! I love the way God’s Word seems to speak to my specific situations as I read through His Word. I know He’ll do that for you, too. I’d love to hear about it. Email me, leave a message on our Apprehending Grace Facebook page, or post a comment at the end of any blog. The recommended reading schedule for July is below. Join us as we read through God’s Word a few chapters each day. Our Resting at the River’s Edge schedules help you stay on track with us…but if you fall behind, don’t worry. Just keep reading. Before you begin reading, ask God to reveal Himself to you – He promises that He will. God will meet you and you will be blessed. Our Resting at the River’s Edge schedules provide two reading plans. 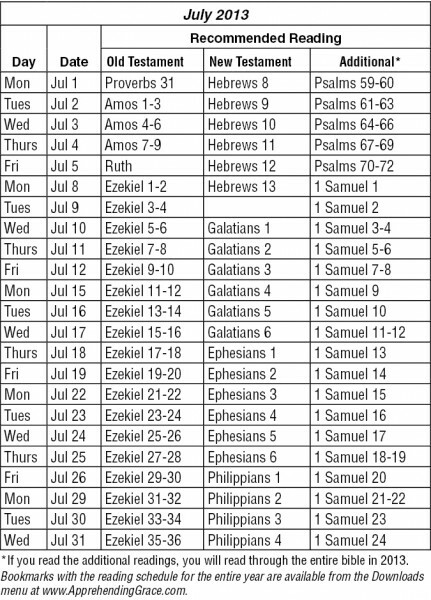 The first two columns of the schedule allow you to read through the entire Bible over a two-year period. 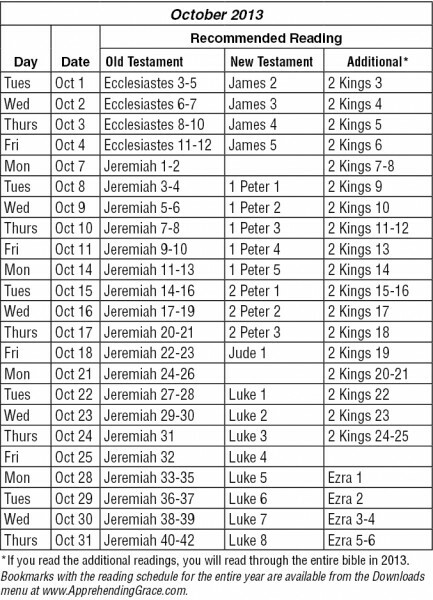 During those two years we read through the New Testament twice and the Old Testament once. The “Additional Readings” in column 3 put you on a one-year reading plan. 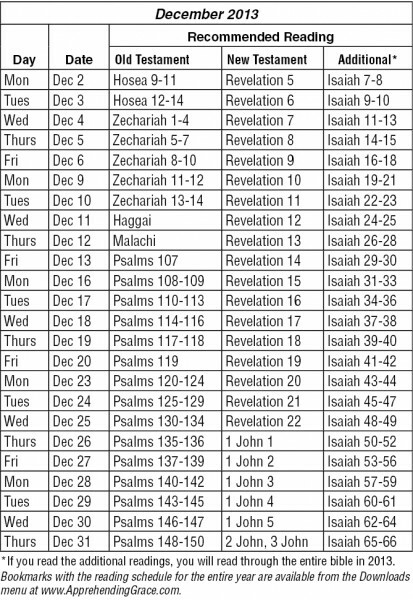 If you read through both the scheduled and additional readings, you will read through the entire Bible in 2013. I hope you’ll join us! Reading through the Bible each year is one of my favorite things to do. I know that God will speak to you and your needs as you read. Since God usually speaks to me as I am reading His Word, you’ll find that many of the blogs I write relate directly to the Resting at the River’s Edge readings for that week (or sometimes from the previous week because I fall behind in the readings sometimes, too). Click on one of the following buttons to open a PDF file of the May/June bookmark or all bookmarks. After the file has opened, you can print it or save it to your hard drive from your browser’s file menu. Click here for the May/June 2013 recommended reading bookmark. Click here to download all bookmarks for 2013. I hope you’ll join us in Resting at the River’s Edge, and that you’ll email me, telling me how it’s going. You can also leave a message on our Apprehending Grace Facebook page, or post a comment at the end of any blog. What has God spoken into your heart today? Share it with us so that we might also know Him better. 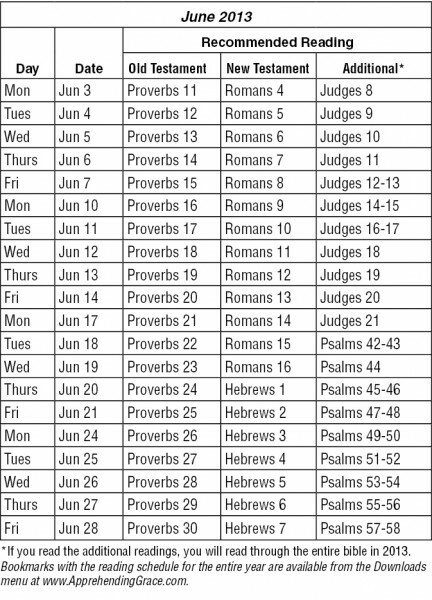 The recommended reading schedule for June is below. 1These are the proverbs of Solomon, David’s son, king of Israel. 2Their purpose is to teach people wisdom and discipline, to help them understand the insights of the wise. 3Their purpose is to teach people to live disciplined and successful lives, to help them do what is right, just, and fair. 4These proverbs will give insight to the simple, knowledge and discernment to the young. 6by exploring the meaning in these proverbs and parables, the words of the wise and their riddles. 7Fear of the LORD is the foundation of true knowledge, but fools despise wisdom and discipline. I don’t always enjoy reading the book of Proverbs, but I appreciate its value. The Proverbs are straightforward in their purpose and advice. There are many who read through the book each month, reading about a chapter each day. After all, who doesn’t want wisdom? The first verses of Proverbs 1 establish the purpose of the book – to teach wisdom and discipline. Why would anyone want to be taught discipline? Because it leads to a successful life. That’s a pretty good reason. So as we begin to read Proverbs in our Resting at the River’s Edge readings, let me encourage you not to breeze through them, not to allow your mind to go into autopilot as you read. Ask God before each reading to teach you the wisdom and revelation he has for you in each day’s passage. 2Tune your ears to wisdom, and concentrate on understanding. 3Cry out for insight, and ask for understanding. 4Search for them as you would for silver; seek them like hidden treasures. 5Then you will understand what it means to fear the LORD, and you will gain knowledge of God. 6For the LORD grants wisdom! From his mouth come knowledge and understanding. 7He grants a treasure of common sense to the honest. He is a shield to those who walk with integrity. 8He guards the paths of the just and protects those who are faithful to him. This last passage is the one that prompted me to write today. The Lord grants a treasure of common sense to the honest. I grew up believing that I didn’t have any common sense. I knew I could study and learn things, but things that others knew I didn’t seem to know. That logical answer that many called common sense eluded me. As an adult, I understand that those perceptions were lies and that I do have common sense, but childish notions often haunt us into adulthood despite our best efforts to dispel them. God grants a treasure – a treasure – of common sense to the honest. I seek to be an honest person (because long ago God got my attention with another proverb, but we’ll save that story for another blog). I can trust that God will grant me a treasure of common sense. Along with it He’ll grant me wisdom, knowledge and understanding. He’ll also be my shield and guard my paths. Sounds like great reasons to ask God to reveal Himself to me as I read through Proverbs this month. Will you join me? If you haven’t downloaded the Resting at the River’s Edge reading schedule for May, you can do it here. As you read, I’d love to hear what God is speaking to your heart. Post on our Facebook page or add a comment here. Blessings, friends, as you seek God for wisdom. May He give you a treasure of common sense along the way. Get to know God better by reading through the Bible a little bit every day. Pray, ask God to reveal Himself to you, then read. Our Resting at the River’s Edge schedules help you stay on track…but if you fall behind, don’t worry. Just keep reading. God will meet you and you will be blessed. Resting at the River’s Edge schedules provide two reading plans. 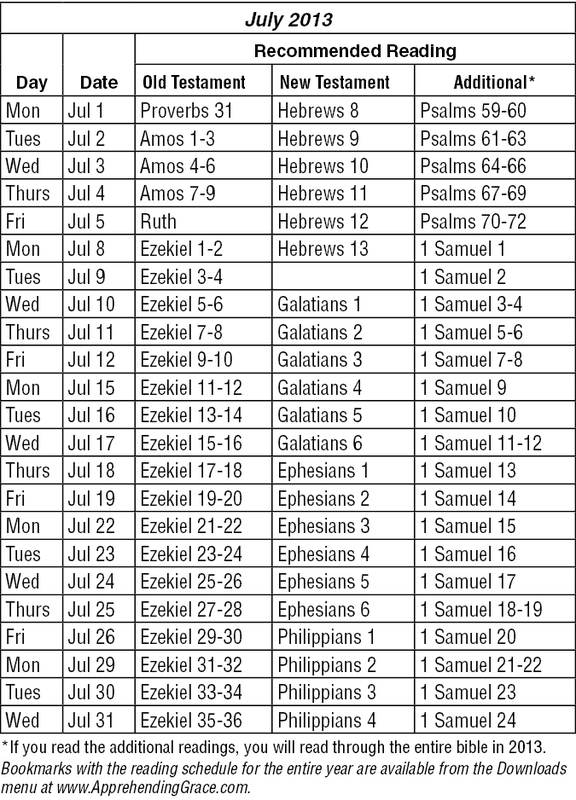 The main readings schedule readings that allow you to read through the entire Bible over a two-year period. 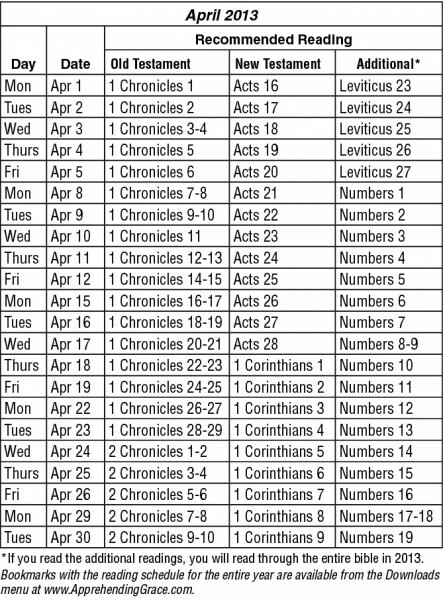 During those two years we read through the New Testament twice and the Old Testament once. The “Additional Readings” in the schedule put you on a one-year reading plan. 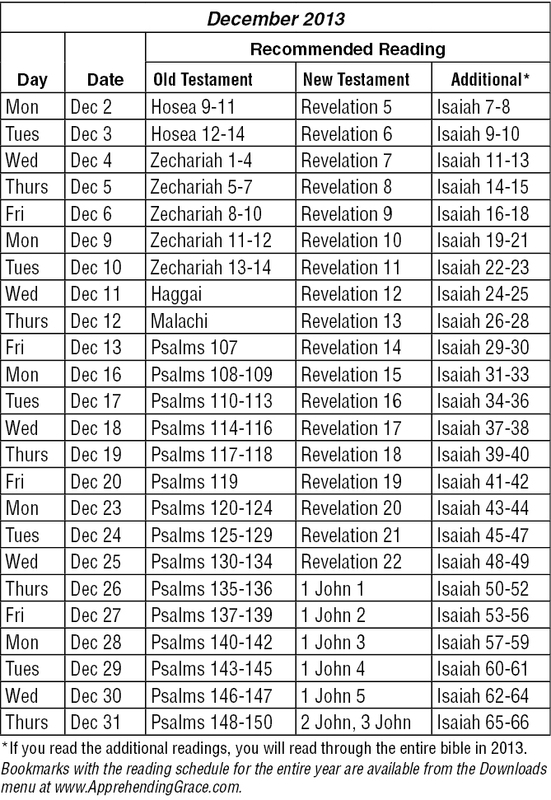 If you read through both the scheduled and additional readings, you will read through the entire Bible in 2013. I hope you’ll join us! Reading through the Bible each year is one of my favorite things to do. I know that God will speak to you and your needs as you read. He always does. Since God usually speaks to me as I am reading His Word, you’ll find that many of the blogs I write relate directly to the Resting at the River’s Edge readings for that week (or sometimes from the previous week because I fall behind in the readings sometimes, too). Join us as we read, then email me, leave a message on our Apprehending Grace Facebook page, or post a comment at the end of any blog. What has God spoken into your heart today? The recommended reading schedule for May is below. Reading God’s Word is the best way to get to know God. We learn who He is and how He works. It is His love letter to us, His instruction manual written for us, and it breathes His Spirit upon us as we read. You’ll find our April reading schedule in the March/April bookmark and in the table below. Click on one of the following buttons to open a PDF file of the March-April bookmark or all bookmarks. After the file has opened, you can print it or save it to your hard drive from your browser’s file menu. Click here for the March/April 2013 recommended reading bookmark. Click here to download all bookmarks for 2013. What treasures have you found while reading this week? Share them with the rest of us. You can email me, leave a message on the Apprehending Grace Facebook page, or post a comment at the end of any blog. The recommended reading schedule for April is below.